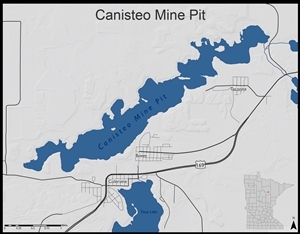 The Canisteo Mine Pit (Canisteo) is located north of the cities of Coleraine, Bovey, and Taconite in Itasca County, Minnesota. It is a pit lake formed in a complex of numerous inactive iron ore mine pits. Mineral exploration began in the area around 1888. Iron ore mining began in the Canisteo in 1907 and operations continued through 1986. Mining operations in the Canisteo consisted exclusively of scram operations between 1980 and 1986, which used previously blasted rock from the pit bottom. The Mineland Reclamation Rules for ferrous mining were adopted in 1980 and require mining operations to plan for closure and reclamation at the onset of mining. Thus, reclamation was only required for disturbances in the Canisteo as a result of the scram mining operations and not the entire pit. Since the majority of the Canisteo is considered essentially a legacy mine pit, there is no private party responsible for water management. After iron ore mining and subsequent pit dewatering stopped, the pits began to fill with water from precipitation, surface water inflow, and groundwater inflow. In 2008, the DNR was allocated funds to address the rising water level of the Canisteo, including the evaluation of the surficial groundwater flow from the Canisteo, pitwall stability, and the construction of a potential outlet. First, design and construction of a Bovey drain tile system was completed in 2011. Design of the Canisteo outlet structure was subsequently completed, but construction of the outlet was cancelled because of budgetary constraints and a potential for mining operations to use water from the Canisteo. As the Canisteo water level increased, the hydrologic connection between the water level of the Canisteo and the city of Bovey’s water table became evident. The effects from the already high water table in the western portion of Bovey were worsened by the rising water level in the Canisteo as water traveled through glacial sediment to the south. 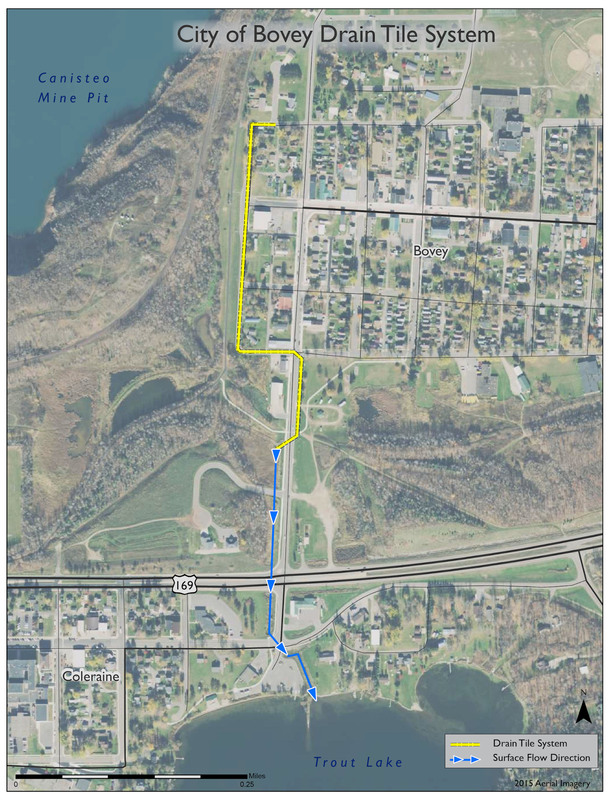 To decrease additional groundwater flow toward the city, in 2011 the DNR designed and constructed a drain tile system along 1st Avenue to divert groundwater to Trout Lake. The DNR is responsible for the continued maintenance of the drain tile system. Magnetation LLC (a subsidiary of Magnetation Inc.) was authorized to pump water from the Canisteo for mining operations in 2012, under a DNR permit. The water was used for two scram mining operations: Plant 2 and Plant 4. Magnetation LLC filed for Chapter 11 bankruptcy on May 5, 2015 and in October 2016 ceased pumping from the Canisteo for mining operations. ERP Iron Ore, LLC purchased numerous Magnetation LLC assets through bankruptcy court in 2017. Thereafter, previously issued water appropriation permits to Magnetation LLC were transferred to ERP Iron Ore, LLC. 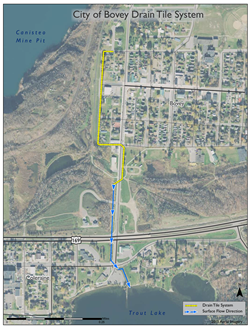 One of these permits was also amended to authorize the company to use water for operations of their Grand Rapids Plant, formerly Plant 4, as well as manage water levels in the Canisteo. This permit authorized maintenance of water levels between 1295-1300 feet above mean sea level (msl) but did not require ERP Iron Ore, LLC to keep water levels below 1300 feet msl. ERP Iron Ore, LLC intermittently pumped water from the Canisteo between October 2017 and April 2018. The Canisteo continues to gain water and will need an engineered outlet structure and route in the future to prevent flooding. To enable informed discussion with state leaders and legislators, a number of state agencies are collaboratively working to gather data. The initial data gathering will be to collect water quantity and water quality information from the pit as well as potential nearby surface waters which may be receiving waters in various designed outlet scenarios. Future work may include but is not limited to continuation of water level monitoring, bathymetric surveying, installation of groundwater wells, surveying potential outlet routes. Additional work may also include a study to evaluate pitwall stability. Once a preferred outlet location and route are chosen, future phases would include engineering a design and then construction. Future data gathering, engineering design, and construction would need to be funded before these phases of the project could move forward. The DNR actively monitors the Canisteo water level and groundwater levels surrounding the Canisteo. The city of Bovey drain tile system is also monitored for flow and system efficiency. The Canisteo water level trend shown represents a combination of manual measurements and continuous logger measurements.